Here I am giving breakfast, lunch ideas for kids and few tips on how to present food and make it appealing to them. 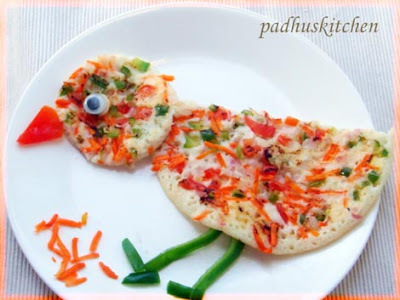 More Breakfast ideas with dosa Kids love colors, so make the food as colorful as possible. Also Refer Carrot Uttapam for kids. (Fun food for kids). Heat oil, fry onion, garlic and green chilli for a few minutes till onions turn pink. Then add all the vegetables, salt needed, chilli powder, coriander powder, kitchen king masala and saute in high heat for a few minutes. The vegetables should be crispy. Important -Chop all the vegetables finely. Take a chapati, keep the filling in the middle and roll the chapati tightly and secure it with a strip of aluminum foil, so that it is easy for the child to hold in the middle and eat. Instead of sweet corn, you can add button mushrooms or paneer, but do not add all the 3 together. Can rice be boring for kids if you present it like this!! !Make different fun shapes and sizes or faces with food. Use fresh vegetables to decorate the dish. Kids are sure to get attracted. Here are a few creative ideas to make your kids eat healthier food. Instead of compelling them to eat more vegetables and greens, make one pot meals as kids love it very much. If you want them to eat greens, prepare mint pulao or methi pulao. You can prepare pulao or paratha with almost any greens. Incorporate fresh vegetables in your kids diet by adding lot of vegetables to upma or decorate food with vegetables. Make funny animals figures with food and ask them also to participate in it. They will enjoy it to the core. Try it yourself! Use cookie cutters to cut fruit and vegetables into different shapes and serve them, rather than serving them plain. Prepare mixed fruit custard or banana custard with chocolate sauce drizzled all over. Yummm!!! Use fruits as toppings in their favorite dessert as I have done in my fruit trifle. Kids love sandwiches. Use cookie cutter to cut it into different shapes and dress up sandwiches with funny and interesting faces .You can use steel cups to cut bigger circles.Find interesting sandwich recipes and presentations ideas in the link below. Make salads/raw vegetables, a part of their diet from their younger days, otherwise they will never eat salads when they grow up. Do you know kids learn many behavior by watching their parents. If you want them to eat healthy, then you must first eat healthy food. Yes, you have to be a role model to them. You do not have to deprive them of cakes and other bakery food, make it an occasional treat. Hope all mothers out there found this post useful. If you liked this post, do bookmark it and share it with your friends. I have given the share buttons on the side of the page. wow wow awesome collections cant take my eyes off.. Came across your space today. Love it. Wow wow so many lovely break fast ideas for kids.. i liked that carrot shaped dosa presentation looks so nice!! Wonderful innovative ideas.. Looks good to practice..
Thanx for visiting my blog n leaving ur sweet thoughts.. You too have a neat space , dear! It is really a great and useful post. I already make use of your breakfast ideas and even yesterday I checked it for todays breakfast. Wow thanks for sharing all these yummy recipes for lunch box...every morning I have headache in preparing lunch for my fussy daughter..
hi padhu, you sure know how to woo kids and have great artistic and culinary talent :btw- you visited my blog once a few months ago. Awesome ideas Padhu!!!! With kids...we adults are gonna enjoy too for sure...Even now i enjoy cheese topped dosas mom makes...I used to have them since school days..LOL!!!! Beetroot topping is a nice onew too...Thats new to me...Thx dear for such a wonderful, handy post..
wow, this is a beautiful collection of kids delight dishes..innovative and wonderful recipes..thanks for the wishes at my space.. These are great ideas for kids! The carrot dosa is so cute. Hi Padhu, first time here..innovative ideas..love your space..wonderful recipes...very creative.. Am your happy follower now..:) do stop by mine sometime..
WOW WOW I just wonder how you are able to do these with kids?? I struggle to do work with kids!!! Great work! Love your posts! your presentation is eye catching and delicious! keep up the good work. Loved the way you presented the dishes!!! They look so Yummy!!! My first time here...hope to come back often! Thanx for dropping by n leaving your sweet comments!! really nice ideas but not for working moms as time consuming to decorate all this when in the busy morning schedule one has to cook lunch , breakfast and also make preparatiosn for dinner...do you have any ideas for quick but yummy breakfast fixes? decoration is really great..thanxs for such useful and homemade tips..keep posting such ideas. All your recipes are interesting and easy to prepare...Thanks for sharing. Very interesting recipes. More creative and delicious too !! Thank u very much sis. I try it. My angle like very much. very nice, really awesome creativity, i also tried it. Hi, my 1yr8mnths kid want different taste daily.. I'm working woman.. I didn't introduce wheat yet... I only give idly, dosa, pongal to her. She didn't like that. Pls give some easy breakfast recipe. Perfect recipe for kid's everydayhealth breakfast! 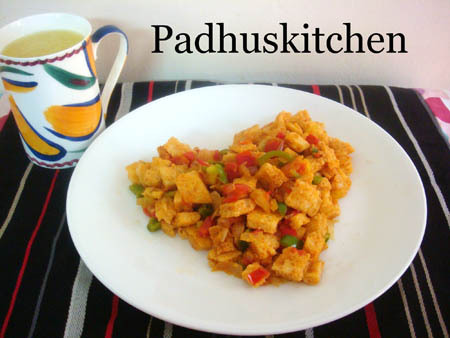 Thanks for sharing this delicious recipe Padhu ! !